The Best 40th Birthday Gift Idea Is A Trip Down Memory Lane. Give A Fantastic, Fun Gift They'll Love and Remember. Literally. 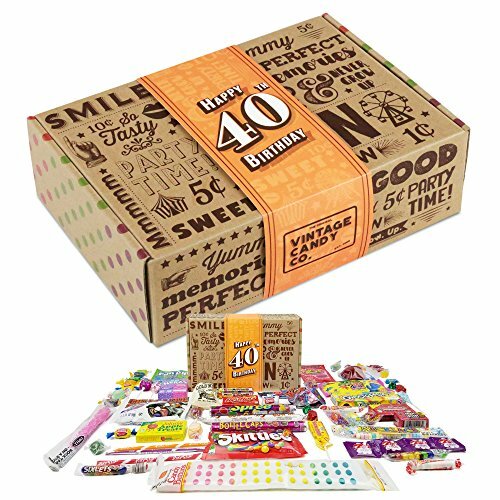 Introducing Vintage Candy Co.'s 60th Birthday Candy Gift Box. A Delightful Keepsake Box of Childhood Memories That Existed Cir. 1978. This IS THE PERFECT Milestone Birthday for someone turning Sixty. Its Also A Great Gift, If You're Looking For Something Fun AND Creative. It's Sure To Get Happy Chuckles, Belly Laughs, And Yes, Even Extreme "Girly Giggles" (We won't tell!). That's Right. Watch With Amusement As Your Surprised 40 Year Old Transforms Before Your Eyes And Becomes A Kid-Like Birthday Boy or Birthday Girl, Picking Through Their Favorite Candies From Childhood. Delight In Fond Childhood Memories With Classic American Candies of An Era Gone By. Order Now And Give A SPECIAL 40th Birthday Gift That Will Be Remembered With A Smile! **Special Buyer's Note: Common Seasonality May Require Periodic Candy Substitution Of Equal Value. INCLUDES SPECIAL 1978 NEWSPAPER STYLE INSERT! If you have any questions about this product by Vintage Candy Co., contact us by completing and submitting the form below. If you are looking for a specif part number, please include it with your message.